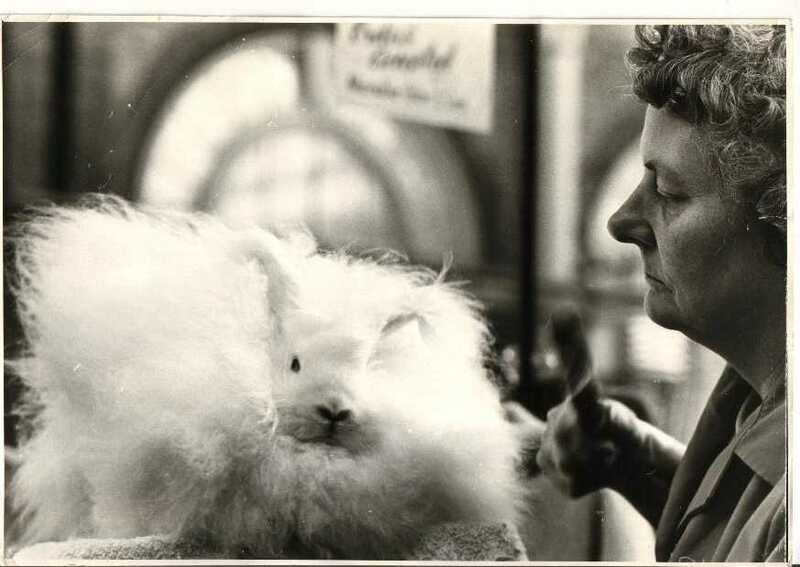 One of the many key figures in angora rabbits was Mrs Barbara Pratley and here is a short article by Yvonne Hobbs Fothergill sharing her memories of Mrs Pratley. I first met Barbara Pratley many years ago when I attended my first National Angora Stock Show. Although I kept rabbits, including Angoras, most of my life, I had recently joined the BRC and decided to show them, I groomed and penned my exhibits and Mrs Pratley came over and introduced herself and offered to give me a grooming lesson. I was delighted to accept as I had never shown an Angora before and she took me to a back room where she miraculously produced a wonderful rabbit from a box and proceeded to teach me what to do. She was so kind, friendly and helpful and I discovered that apart from our love of Angoras we also had cats in common. She invited me to visit her house to see her animals and I visited many times. Mrs Pratley is still sorely missed by the Angora club. She was wonderfully knowledgeable about all aspects of the Angora and was always willing to share he great store of knowledge, having written many articles which are still of value today. In fact, shortly before she passed away we collaborated in producing a book for Fur and Feather designed to help beginners and I was so pleased that it was published before she died. The book is now in its second edition and hopefully will continue to be of help to new Angora keepers. Barbara Pratley was a much loved friend and mentor. She has a lovely sense of humour and was a judge par excellence. She was also a spinner of great repute. She was our much loved and respected President and nobody can follow in her footsteps, She was an exhibitor second to none and produced 63 Champions during her reign as Queen of the Angora club. She will never be forgotten. Posted 27/11/2017 by LH & filed under Members.